In my teens, I was an avid RPGer. I'd push aside my textbooks and write adventures for White Wolf or D&D all night, sometimes even titling each session as if it were a TV episode. Then, at the end of the year, I'd fail all my courses. Fun! These days, I ain't got time for that. Damn you, real world! But I love boardgames. And every so often, a game comes along that reminds me how fun it can be to escape for a while into another life. The best parts? No prepping, no need for all-night sessions, and you can bundle it all up once you're finished and head home to re-enter the real world. Here are a few of mine. PLEASE share some of your own, along with any anecdotes! -- Running for our very lives as the entire house gets pulled underground by writhing tentacles. R.I.P. party. -- Silly in-character discussions based on the silliness of the plot turn. "You fools! My master plan is successful! I've lured each of you here so that I could shrink you down to the size of mice!" Meanwhile, we successfully escape on a paper airplane, or some such. This was a clear winner with my zombie-lovin' crew. Nothing beats being chased by an ever-growing mass of rotting corpses when it comes to empathizing with one's character. Lots of shouting and cheering at winning strikes, and plenty of tension when one character is surrounded while the others are making for the exit. That character was mine. The lawman. I shouted for someone to turn around and help, but only the waitress came to my aid. And when it became clear that the situation was hopeless (A mob cut off my escape), I told her to run, and then I was eaten alive. We try to play any game like this in a campaign style, where surviving means keeping some of your stuff for next game, and death means you can't play the character anymore (until all others have been played, at least) and you've only got the basic default equipment. That way, there are stakes. As mentioned above, my gaming crew plays games like this campaign-style, which helps us attach to our characters and care if things go south. 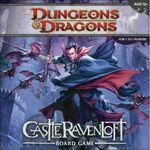 In this case, we suffered a party kill against Strahd himself, which was devastating, since the player had to start with basics, at level one, against the titular boss. On that note, the fact that we can get to Wrath's last boss having beaten him several times already (due to Encounter cards) means we're not really worried about him now. And again: Not worried = not fun. I'll start off with a subtle message: Go buy this game immediately. It's great. That aside, I love its MtG-like mechanic, where if you can't draw, you can't live. I love that there are hundreds of cards and that I still haven't fought every kind of monster or found every item (and I've been playing it like a madman). But in terms of story and character, I knew I had a winner when I came across a monster that had just killed one of my characters. (It was a giant hermit crab, please don't laugh.) Upon flipping the card and seeing that jumbo version of the pet store perennial, I got nervous for the new character. Not this time, Giant Hermit Crab. Not. Ever. Again. A Blessing of the Gods and some good rolling later, I claimed victory and even grabbed some chain mail that must've been lodged up in that shell somewhere. 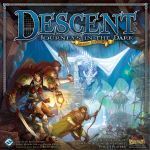 Descent is huge, and wonderful, and beautiful, but it can run a risk when it comes to getting into character. It's easy for the Overlord; just Mwa Ha Ha every so often, and you're good. But the heroes often feel so rushed, so pressed for time, that you might not enjoy the moment because it turns into a discussion of maximum efficiency. 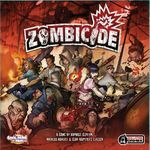 Still, it's a terrific game, and it offers what games like Zombicide and the D&D line don't: an extremely well-planned campaign style of play. Herein is the RPG magic. If the heroes win, they know they've truly put a dent in the Overlord's plans. If not, they watch the lieutenant running off with the precious artifact, knowing that later in their journeys, that artifact will be used for evil, and most likely against the party.